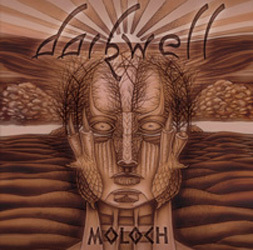 Originally formed back in the adolescence of the metal female voices genre, Darkwell released two albums on Napalm back in the early days of the twenty-first century before seemingly performing the ultimate disappearing act shortly afterwards. ‘Susperia’, released in 2000, had featured Alexander Pittracher on vocals, with guitarist Roman Wienicke, keyboard player Christian Filip, bassist Roland Wurzer and Moritz Neuner behind the drum kit. Fast-forward four years and ‘Metat[r]on’ saw quite a different band waiting for the ‘record’ light to blink on, with the rhythm section now working alongside guitarist Matthias Nussbaum, keyboard player Raphael Lepuschitz and Stephanie Luzie, whose vocals tinged the new material from a different palette to her predecessor. So much for the history lesson… Ten years later Darkwell announced their reunion with a show at the Wave-Gotik-Treffen festival in 2014. With new label Massacre picking them up for their hotly anticipated third album it’s pretty much back to the future for the band which sees the later Darkwell line-up (except for Neuner who, of course, had hooked up with Leaves’ Eyes in the meantime and has been replaced by Michael Bachler) joined by Pittracher once more to form a marriage made in goth metal heaven. Cast from the shadows once more and hungry for success Darkwell 2016 are undoubtedly a force to be reckoned with. The intervening years have not so much aged the musicians as matured them, and while a number of the MFV bands still even now fall back on a propensity to bluster and bedazzle Darkwell take a more direct yet inherently subtle approach, producing a clutch of slow-burning compositions infused with an innate grace and sensibility. Much of the band’s overt passion lies in the elegance of Pittracher’s vocals, which for the most part present an aching fragility (perhaps best displayed on ‘In Nomine Serpentis’ or the unfeasibly catchy ‘Save My Sight’) albeit one that masks a defiant, aggressive heart. Darkwell’s trick is to present songs as Russian Dolls – there’s always something more to discover within, one more secret to unveil – and when the band does snap back as they do on, for example, cuts like the ferocious ‘Yoshiwara’ or the unruly title track, their bite is most certainly worse than their bark. The album itself plays out with the seven minutes of the sprawling, majestic ‘Awakening’, although there’s a digipack which boasts a couple of bonus cuts, one of which being an updated version of ‘Metat[r]on’’s ‘Hope Unborn’. A band resurrected, an album of sublime beauty… What more could you ask for?